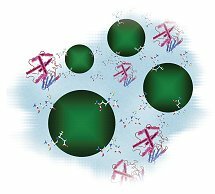 BN P & S offer a number of solutions for the processing of proteins and peptides: For general purification DEAE, CM, antiGST and antibody particles. The QuickPick™ SML (Small-Medium-Large - scalable for various sample sizes) purification kits provide a fast and simple means of purifying proteins from a variety of samples. The technique does not require any organic solvents and eliminates the need for repeated centrifugation, vacuum filtration or column separation. Available from Bio-Nobile are methods used in the fractionation of proteins, based on weak ion exchange. 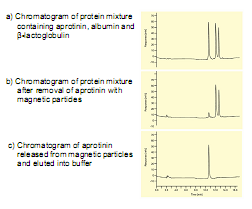 They are designed to help in the evaluation of the protein fractionation prior to actual purification. This Technical Note describes methods for weak cation exchange using carboxymethyl particles (CM), and weak anion exchange using diethylaminoethyl (DEAE) particles.